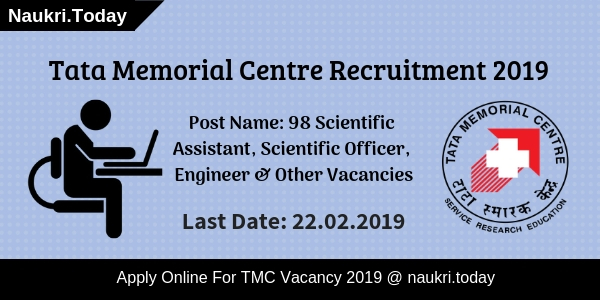 Hello Friends, Are you looking for Tata Memorial Centre is going to appoint candidates on Scientific Assistant, Scientific Officer C, Engineer, & Other Posts on Contract Basis. 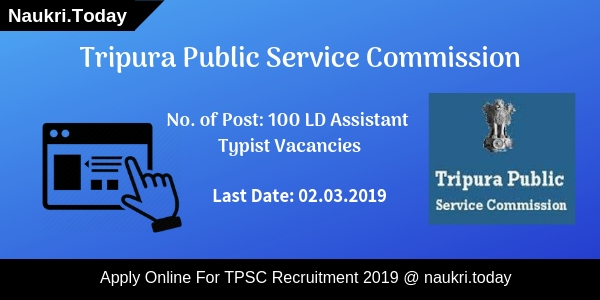 There is 98 Vacancies are available for TMC Recruitment 2019. The Registration Process will take place from 05 February 2019 till 22 February 2019. Applicants who are Post Graduate with the relevant subject given below can fill up their online application form. General and OBC Category Participants need to pay Rs. 300/- as an application fee for TMC Vacancy 2019. SC/ST/Ex-Serviceman/ Female Candidates/Person with Disability need not pay any amount as an application fee. For more information candidates may refer to the below article. It Is Compulsory To Send Hard Copy Of An Application Form? How to Apply For TMC Vacancy 2019? Download TMC Notification 2019? 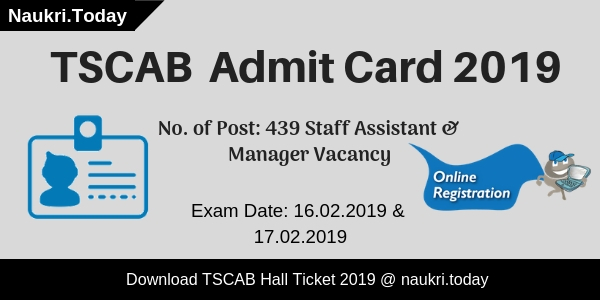 The Last Date To Apply Online for TMC Vacancy 2019 22 February 2019 till 05:00 P.M.
Last date to apply online for TMC Bharti 22.02.2019 till 05:00 P.M.
B.Sc. in relevant subject with minimum 55% marks. Diploma in Medical Laboratory forms a university recognized by Central/State government. For Vacancy Wise Qualification details candidates may refer to the TMC Notification 2019. Applicants who applied for TMC Recruitment 2019 must fill up their online application form before the last date. After filling up a registration form must take print of it. Candidates may send their application form hardcopy to the given address before the closing date of submission of hardcopy. If your hardcopy will be reached after the last date the department may not consider your application form. Address: 3rd Floor, Service Block building, H.R.D. Department, Tata Memorial Hospital, Parel, Mumbai – 400 012. Participants should log on to the official Website of Tata Memorial Central i.e tmc.gov.in. After that submit your application fee. Aspirants must send a hardcopy of an application form to the given address. Conclusion: Tata Memorial Centre Department has issued notification regarding 98 Scientific Assistant, Scientific Officer, & Other Vacancies. Interested candidates may apply online for TMC Recruitment 2019 before the last date. Tata Memorial Centre, has Published TMC Recruitment 2017 Notification for 119 Assistant Nurse, Technician and Administrative Assistant Posts. Eligible or Interested applicants may apply online for TMC Administrative Assistant Recruitment 2017. TMC Online Application form now available.Eligible candidates can apply online on or before the last date 26-12-2016 up to 05.30 PM & send application on or before 02-01-2017. You can also visit Tata Memorial Centre official portal. About Tata Memorial Centre (TMC) : The Tata Memorial Center has situated in Parel, Mumbai in India. It is an expert cancer treatment and research center, closely connected with the Advanced Centre for Treatment, Research and the Education in Cancer (ACTREC). This is a golden opportunity for all the candidates who are looking for TMC Govt. Jobs In Mumbai. Interested applicants can fill online form for TMC Vacancy 2017 on or before the closing date. For more details about Tata Memorial Centre Recruitment 2017 check given below details. Education Qualification for TMC Vacancy Notification : Those candidates who have cleared Master’s degree in library Science/ Information science for S.N 01, Ph.D degree in Biological science for S.N 02, Senior most position for S.N 03, Graduate or post graduate in management or HR for S.N 04 for Tata Memorial Center Recruitment 2017. Applicants should search more details regarding Education Qualification refer to TMC Official Website. For Post No. 1 to 4, 9 : Candidate minimum age limit should be 45 years as on 26.12.2016. For Post No. 5 & 6, 10 : Participants age limit should not be more then 40 years as on 26.12.2016. For Post No. 7 to 8, 11 to 15, 21, 29: Applicants upper age limit should be not exceed 35 years as on 26.12.2016. For Post NO. 16 to 20, 22 to 27, 30 : Candidate above age limit should be 30 years as on 26.12.2016. For Post NO. 28, 31 to 36 : Applicants age limit should not be more then 27 years as on 26.12.2016. TMC Examination fee 2016 – 2017 | TMC Assistant jobs 2017 : Those applicants who are interested for TMC Recruitment 2017 need to pay Rs. 300/- for by using Debit Card/ Credit Card/ Online. SC /ST / Female Candidates / Persons with Disabilities / Ex-servicemen (1st time applying for civil post after serving any rank) are exempted from paying application fees for Tata Memorial Centre Recruitment 2017. TMC Exam Selection 2017 | Assistant job of TMC 2016 –17 : Candidate should be selected on the basis of best performance in Written Exam, Skill Test & Personal Interview. Candidates should search “Job Vacancy ” section And click on it. New Page is open, Applicants should search “Advt. No. 129_2016, Positions Available for Non- Medical Candidates. ( TMH Parel Mumbai and ACTREC )” l;ink and click on it. Read all detail for TCN Recruitment 2017. You are eligible for TCN Officer Recruitment 2017,so you can fill TCN Application form. Fill all the detail carefully for TCN Vacancy 2016 – 17. Candidate must upload your Scanned signature & passport size photo. Recheck all detail after filling Online Application form and then download . Then Send your Application form 2017 from below given address. Conclusion : TCN Recruitment 2017 for 119 Assistant Nurse, Technician and Administrative Assistant Vacancies in Government Department. Applicants may submit Tata Memorial Centre Online application form on or before the last date 26.12.2016.